And it may be the most significant thing I do in my lifetime. 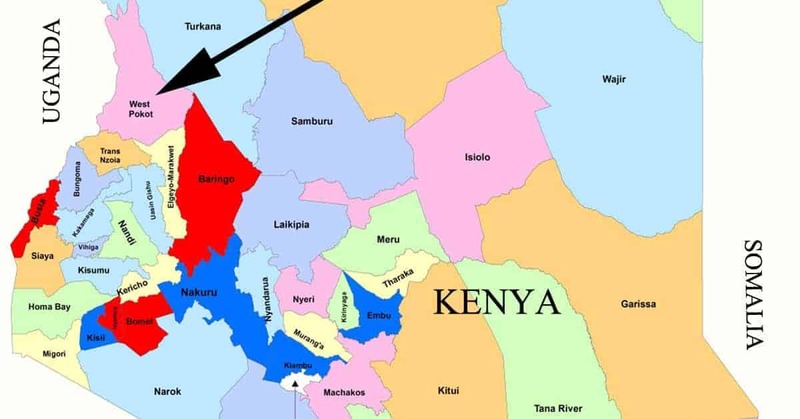 Our outreach to brothers and sisters in Kenya and through them to the tribal people of Pokot, is the strangest connection God has invited me into. This is nothing I sought out or tried to accomplish. God brought it into my life gently, but persistently, over time. He knew that somehow I could help him connect people with the great need on the other side of the world to people here with the resources to help out. Over a hundred thousand tribal people there were dying of malnutrition and disease, without any aid from the United Nations, their own government, or nonprofit organizations. This is a remote region with no one to help. Their nomadic life had been destroyed by a prolonged drought that killed their cattle-driven economy. The Kenyans we already knew in Kitale were heartbroken when they discovered them and asked if we could share some resources through them. Let that sink in. A group of people we were already helping because of their poverty were wanting to reach out to others they who were even in more need. It’s just nuts. We are not a missionary organization, yet in recent years more than 80% of our budget has gone to help these dear people in Kitale and Pokot. To my utter amazement and delight, people from my podcast at The God Journey and my blog here, responded with generosity and continue to do so over such a prolonged period of time. We’ve been helping in the Kitale area now for over ten years with an orphanage, primary school fees, college tuition, and medical needs. In addition, we started two enterprises—a petrol station and a grain distribution business—to help them employ people and use the profits so they wouldn’t grow dependent on us. That has worked out incredibly well. 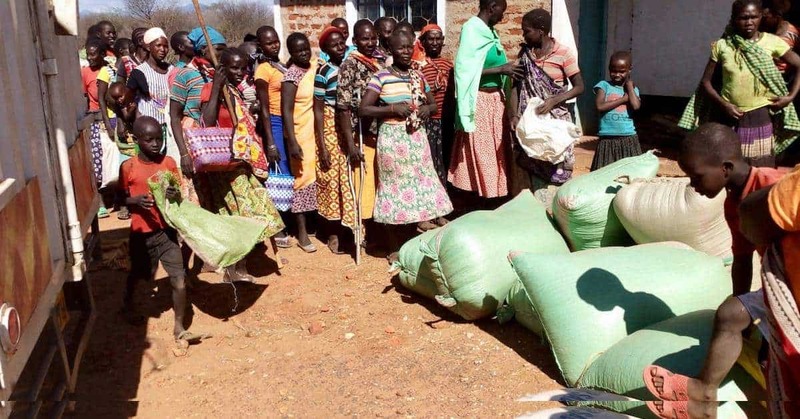 Three years ago they discovered the people in Pokot, and over that time we’ve been able to help relieve their sufferings through food, water, medical assistance and education. Two and a half years ago we began a development plan to help them develop their own resources. We have coaches in the area teaching them how to provide for their own needs of food and water, and about hygiene, which has put an end to 90% of their medical needs. We’ve also helped them start their own businesses to generate income. We drilled six wells and over the past year built five agricultural projects around those wells so that in addition to having clean water for themselves, they can also use it to water their animals and to grow their own crops. It wasn’t just money that helped us here; God also arranged for me to meet people at just the right time—two people who had doctorates in East African development three months after we found out about the people in Pokot, a man working in Thailand who introduced me to the people at Global Hope who were in a neighboring county already doing the work we needed to start doing, a family whom God led to put aside some money for a “great need” coming their way who has given nearly half of the money we have used, an education official from Uganda who could confirm the need in Pokot with government officials in Nairobi when he was skeptical of what we were being told, a lady from Australia to confirm the hearts of those who had contacted us from Kenya, and so many smaller connections that came just as they were needed. Yes, I’ve had to make a lot of decisions in concert with others and at times this has taken far more energy and time than I felt I had to give, but mostly it seemed I’ve just watched God knit something together so much bigger than any of us could have accomplished. The way he arranged for people and support at just the right time has his fingerprints all over this. We have helped feed the hungry, including widows and orphans, rescued the sick and dying, and provided an opportunity for the Gospel to spread among a forgotten group of people. 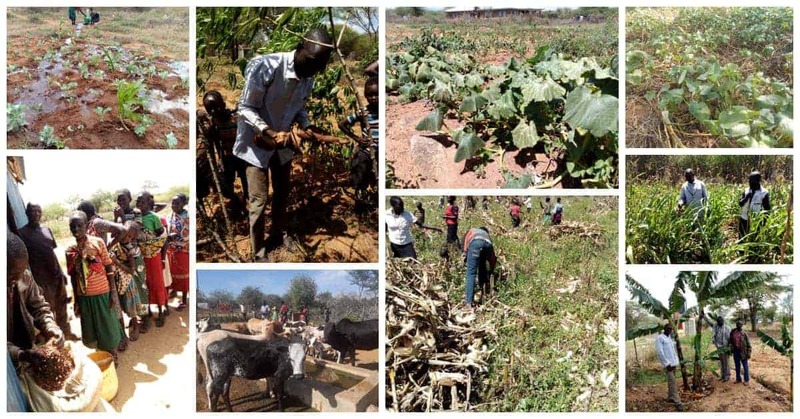 Our plan is for the people of Pokot to be self-sustainable after five years and it looks like we’re on that track. Can you imagine? This happened because of people like you who heard about this need and responded with open hearts and have continued to do so over multiple years. I sit here amazed at what Father is doing to let love be practical in reaching out to a people who were dying of malnutrition and disease. All told, we have given over 1.5 million dollars to assist in all these efforts, and the people there have spent it shrewdly and accountably to maximize its reach to as many people as possible. 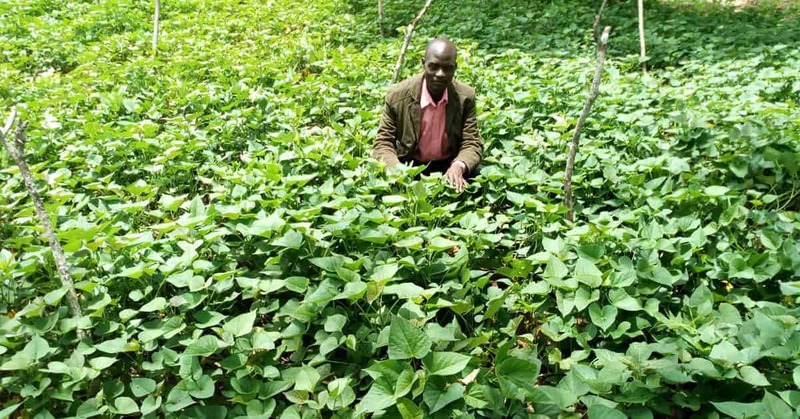 The work in North Pokot has given us hope and this is what we are praying for. The people in these regions are seeing live miracle, this is so amazing. God has granted them what they prayed for some years back. In this portions of land under irrigation it has been divided into different crops and some crops they use small water and it is drought resistance like cassava, sweet potatoes, millet and sorghum, and some maize, this will help exchange of crops time to time as the community will not depend for one crop, this is why as we continue expanding the land for more production, food donation would be reducing hence allow for development. In every week the committee gives the food from the farm produce to the families according to the numbers. This has helped some of the families to something to eat at least every day. 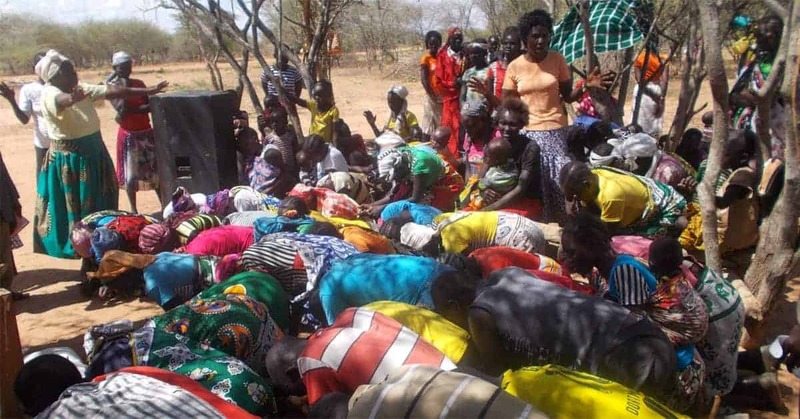 Here is a picture of the people in Pokot giving thanks. Your love has flowed over in Thanksgiving to God, not just from them, but from me as well. I am completely amazed at what God has accomplished to rescue these people and give them life. The people of Pokot bowing down giving thanks for the crops they have harvested.